I am the next stop on your “hop” welcome to my blog! If you started here you might want to go back and start at the begining at the Gecko Galz blog so you won’t miss anything! We have 15 AMAZING blogs for you to visit this weekend, each with some gorgeous projects created using the Gecko Galz collage images, that we are giving you for FREE! 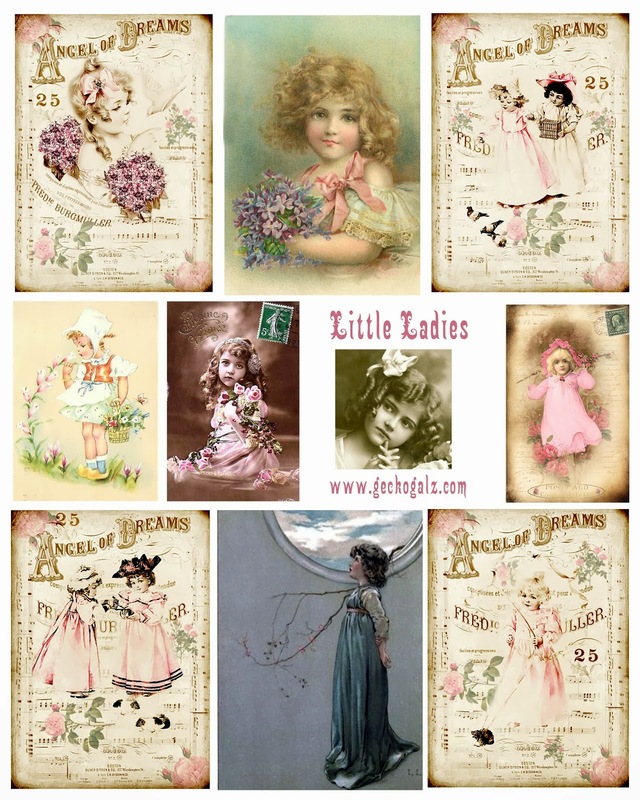 Each blog you visit will have another free Gecko Galz Collage sheet for you to download, The one here is "Little Ladies". Also make sure you collect all the secret words on each blog so at the end of the hop you can enter to win our wonderful treat. So sit back, relax, take your time and enjoy the hop! · Second prize is a The monthly paper pack for an entire year! Each month you will receive our paper pack absolutely FREE! This is a $72 value. First of all, you will need to visit all 15 blogs and leave a comment on each blog :) **This is important so we know you have been to all the blogs **. Collect all Fifteen words (one on each blog site) and at the end of the blog on the Fripperies and Butterflies site there will be a link to email the phrase to Gecko Galz. This enters you in the contest. On October 28th we will randomly draw the 4 winners and email each of you, then we will post the winning names on our website and on the Gecko Galz blog site. Finally, we are having one more give away! If you post our Gecko Galz badge (found on the Gecko Galz Blog) on your blog, facebook page, or website you will be entered to win a Gecko Store Shopping Spree worth $25 - super easy right? Just post a link to your blog on the Gecko Galz Blog so we can come visit :). Just click this link to take you to the full size. Here are a couple projects I made using this beautiful sheet! I have a card and tag. I used my perfect layers ruler to create all my mats for each piece I designed. If you don't have one...you really need to get one! Super Easy to use, and adds layers easily to your projects. I used the Gecko Galz Vanity Fair Digital Paper Pack for my tag background, Ivory card stock for my next layer, then a sheet from MY FAVORITE Wild Roses Paper Pack. To embellish my tag I added some Moss Green Leaves, Havana Brown Seam binding, Deep Ivory 15 mm and Light Pink Wild Mulberry roses, Juliet Lace, Button Bonanza buttons, and cotton candy baker's twine from Really Reasonable Ribbon. #713 Fair glitter on the outside and #160 Rose Gold on the image. Here is my card with another "Angel of Dreams" Gecko Galz image!! On this card again I used my Perfect Layers Ruler to do all my matting. I inked all my edges with Ranger's Vintage Photo Distress inks. I used Tombow Foam Tabs and Scor tape to put all my layers together. In the upper right I glued down a piece of pink crochet lace which I threaded with the cotton candy baker's twine and topped with a Pink Rose. Two of my favorite glitters for Vintage projects! Here you can see I used more of the mulberry roses in Deep Ivory and baby pink. I also used another button with baker's twine and added some Pink Leaves and Crochet Lace. Here is my next card. I used the same Wild Roses Paper Pack and Vanity Fair Digital Paper Pack (by the way when you visit the link for the paper some of the papers are not pictured...but they are beautiful).for my background layers, and my perfect layers ruler. This one I used another natural crochet lace, pink crochet lace, champagne twill chevron, and light pink and deep ivory mulberry roses. More Vintage bonanza buttons with baker's twine and green leaves. Of course that is Juliet Crochet lace peeking out of the left and top. This time I used my Art Glitter glue to create comma strokes and polka dots, and Rose Gold Glitter was added. You can see the Glitter Detail below. Here is my adorable ATC with my favorite image from the Little Ladies Collage Sheet! Here is a quick "how to make" this ATC. I used the paper pack and sized the paper to 2.25 by 3.25, then used my perfect layers ruler to create another layer so that I would have my ATC size. I cut out my pieces, inked them with Ranger's vintage photo. I tucked in my circle piece behind the rose paper which was elevated with foam tabs. Then I added my bow and text boxes. #160 Rose Gold and #295 Ensalada Art Glitters. Now you are ready to go to the next blog site and see what wonderful treats await you there. Just click the name to be whisked away to their blog! OMG! Heather you have out done yourself these are stunning! These are breathtakingly pretty Heather. Superb! These projects are beautiful, Heather. I just love the soft colors, and the way you add layer on layer is amazing! Gorgeous projects! Love all the sparkle! Your ATC is super cool! Heather, thank you for sharing this wonderful hop with me. Thank you for the secret word and freebie images. I will have fun with them. Your ideas and samples are breathtaking. Oh Heather, you have outdone yourself! I LOVE, LOVE your work! You know I love this style and yours is perfection!!!! The other "hoppers" have used up all the good words!! So pretty and GIRLY! I may have to lift some of your ideas. Beautiful projects. The images are lovely and I love the way you've layered the papers. Thank you sooo much for the freebie. I just adored all of your work. Beautiful. Yes, I found great inspiration. Thanks. Heather, I am so inspired! And I love your ETSY store too! Have a wonder-filled weekend! Stunning projects, the images are delightful. Thank you for the images. Beautiful! I am loving the window ATC! Stunning work as usual! So many sweet samples--lovely, Heather! Wow just stunning creations Heather - so soft & pink - just gorgeous!!! Beautiful use of these little ladies! Such BEAUTIFUL artwork, love the ATC. You have really made these images rock! I'm back! I L O V E your creations!!!!! The Little Ladies images are so gorgeous. They are perfect for scrapbook pages with my little niece. Thank you so much for sharing. Very lovely... thanks for sharing. Oh these are so gorgeous. Just love what you did with them too. Wonderful, delicate and truly amazing! How very sweet these are! It IS a beautiful sheet and so is what you have created with it! Nice to see ATC's! Thank you! Wow what an amazing collection of fantastic projects using these oh so cute little ladies images. Thanks so much for the collage sheet which will be used for something (hopefully) as nice as yours! Dang, lady, I MISS YOU!!!! and your ideas and your inspiration!!! Speaking of which, thanks for the projects and "how to"s and thanks even more for these sweet images!!!! Heather--love your pastel color palette. The elevated rose frame is stunning. Wow Heather...your design samples are gorgeous. Each piece is a mini work of art. You are so talented. I love the "little ladies" collage sheet. Thank you for sharing! Absolutely stunning creations from you!! Love them all! Lovely projects!! And thanks for the collage sheet! Gorgeous samples, so soft and lovely!! It was a joy to visit here. You did a simply amazing job creating your projects using this sweet college sweet. The colorway you have chosen captures the vintage feel perfectly especially the glitters. Thanks for the pretty college sheet and I know I'll be putting it to use soon. Oh I totally agree with everyone...these are GORGEOUS girl!!! And Thank you for sharing the goodies!!!! Hi Heather, your projects are stunning, I love them all. Beautiful samples, Heather! Thanks for sharing the collage sheet and hop, I would have missed it without you. Wonderful images! I love your projects as well - especially the Truly Blessed card. Beautiful samples, really very lovely. Heather, as always you out do yourself. I love all your creations!! Thank you for sharing your ideas and the collage sheet!!! What a fun blog hop!! What wonderful projects you made! The collage sheet is sooo cute. Thank you very much. Heather, your images and projects are just beautiful! your images are so pretty and so are your projects! i love all the layering you do and your fabulous use of embellishments! These are my fave images so far. Also love your projects. And I am still hopping !!! Ooooh I love those tags! your tag and cards are gorgeous. thanks for the digi sheet. Thanks for the collage. Beautiful as always.